Bob Carr, despite being a patron of Voiceless, the Fund for Animals, which has a vegan policy, is using his position as Foreign Affairs Minister of Australia to aggressively market kangaroo meat. [http://www.smh.com.au/lifestyle/forever-young-boomers-refuse-to-act-their-age-20130118-2cysa.html] and http://www.lowyinterpreter.org/post/2012/06/14/Finding-Bob-Carrs-Twitter-voice.aspx and http://www.dfat.gov.au/facts/kangaroos.htmlThis will give the impression to China and Russia and indeed the world, that that kangaroo meat is safe to eat and that all Australians are just fine about reducing this unique social creature to a gimmicky gourmet item. This behaviour which strikes animal activists as bizarre is not the only behaviour that has caused environmentalists to question Bob Carr's environmental and humanitarian credentials. Carr is also one of the patrons of Sustainable Population Australia, yet since his rise to the position of foreign minister, he seems to be completely silent about Australia's overpopulation. There is some division of opinion within environmentalists as to whether Carr is sincere or not. Some hope that if he becomes prime minister, he will stand up for the environment and make policies to halt population growth. Those who hope that Carr really is an environmentalist suggest that he must be pragmatic until he rises to true federal power. Others point to his long history on privatisation in NSW and to opportunities missed to save green spaces and veto backward energy policies. Is Carr among the many who sincerely subscribe to the official kangaroo count and the widespread official message that there are 'too many kangaroos'? 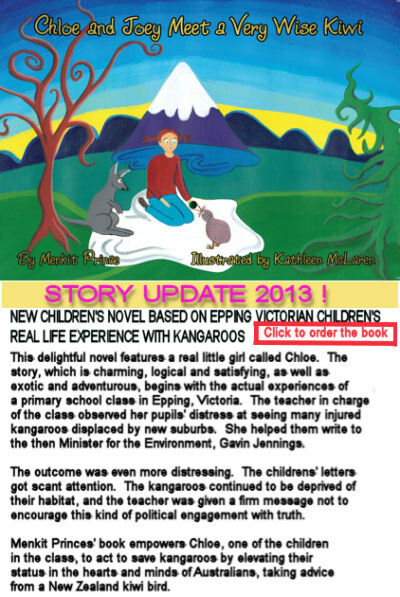 It seems that it is only when you come up against real families of kangaroos and watch them starve slowly over a few years, trapped in new suburban wastelands amid filthy suburban factories in Thomastown and Plenty"Urgent need for wildlife corridors in Australia"; or see how kangaroos have been genetically engineered to midget status in Queensland by gunfire selecting out larger animals, that you start to doubt the official messages. There are no effective laws to protect wildlife in Australia and no effective wildlife organisations with status to complain under the laws that exist. The only way to fight the cruelty and stupidity is by political activism. No-one cares about the evidence that wildlife carers and activists can supply, even if they can produce the bodies. See http://candobetter.net/node/2918 As near powerless as they are, the wildlife activists are the only effective protection for our native animals. Welcome to a new and strange country that bears no ressemblance to the official Australia. Source of top half of picture was http://www.news.com.au/lifestyle/food/kangemu-burger-some-just-love-the-taste-but-others-go-hopping-mad/story-fneuz8zj-1226556148786Source of bottom half was Friends of Animal Army. Wildlife Victoria has created a petition to Grill'd, the Australian fast food chain that is promoting a novelty kangaemu Coat of Arms burger for 2 weeks to cash in on Australia Day. 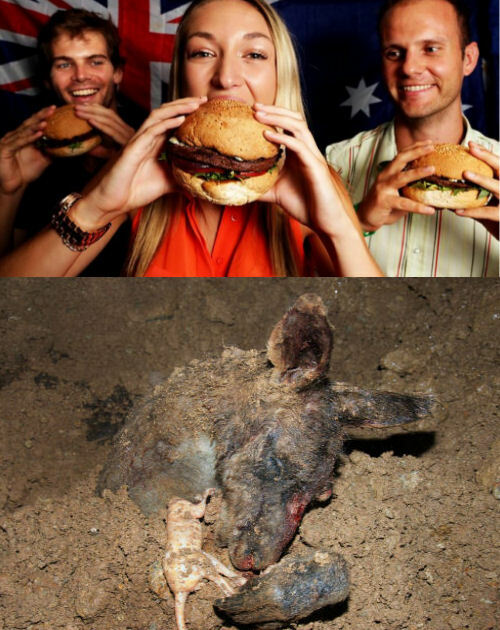 Many wildlife activists want to stop Grill'd from making this a regular menu choice and to use this opportunity to send a clear message that kangaroo meat is not green, clean or humane. Why isn't using kangaroos for meat sustainable? Many Australians, vegan and meat-eaters, have quite valid concerns that the numbers of several kangaroo species, currently treated as highly numerous, may suddenly drop close to extinction. This is in part because of the ongoing effect of killing off the large males and females and thus permitting young and inexperienced males to approach females who would otherwise be off limits. Thus baby kangaroos come into the world in a declining social environment where the extended family and clan has broken down and young parents are not able to protect them. Furthermore, their environments are filled with many new dangers for which evolution cannot prepare them. As well as hunters and increasing rates of gratuitous cruelty from rising numbers of human beings, new roads appear daily where for hundreds of thousands of years there was only grassland. Housing estates go up on traditional kangaroo grazing and social areas, leaving mobs to starve. Many of these gentle and intelligent creatures finish up dying painfully by the side of roads, chased out of their habitats by greedy aspirational humans and then fatally injured by cars. Kangaroos caught in traffic are often a source of callous mirth and entertainment for morning radio presenters in Melbourne as every week or so an unfortunate animal is reported to be running the gamut of morning peak hour traffic with probably no hope of surviving the ordeal. It thus seems obscene for our foreign minister to promote further cruelty for the sake of an industry that is neither clean nor green, nor even lucrative. The kangaroo industry exists on the disadvantaged fringes of Australian society, where farmers have been priced out of sustainable farming, and where a generation of farm workers now seeks unreliable work on the city fringes. 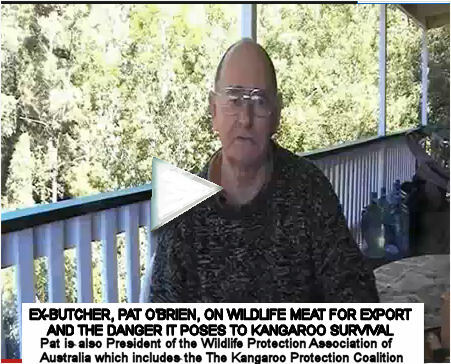 Pat O'Brien, President of the Wildlife Protection Association of Australia which includes the The Kangaroo Protection Coalition has a very long experience of critical analysis of kangaroo counts and kangaroo policies. He also knows all about the meat trade because he was once a butcher. The late high profile environmentalists, Steve Irwin, had such respect for him that he gave him a house and funded his protection of kangaroos for life. 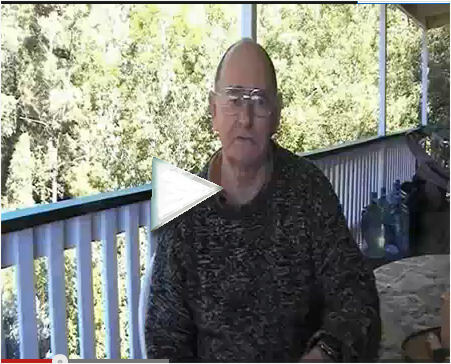 Irwin contacted O'Brien many years ago because O'Brien was the only wildlife association representative person to speak up effectively for kangaroos in Queensland. You can listen to nine short interviews with Pat O'Brien about these matters on you-tube. He is particularly good on kangaroo censuses and on the wildlife meat-export trade and his knowledge is enriched by history. "Probably the single most urgent wildlife campaign is to close down the commercial kangaroo kill. Kangaroo populations have crashed over the last few years due to heavy commercial shooting, compounded by drought, Climate Change, and loss of habitat. Regional extinction is common in many areas of Australia, in every State, and we are being left with small genetically impoverished family groups. Sometimes these 'mobs' are as low as six or eight kangaroos, trapped by suburban sprawl, and unable to escape and mingle with other small mobs." Remember that the Thylacine was hunted to extinction in Tasmania and only a few short decades before the haunting footage of the last animal was filmed, the species was thought to be numerous. Now the only experience for most Australians of this unique Australian animal is on the label of a well known brand of beer. Is that all we will know of the kangaroo 50 years from now? 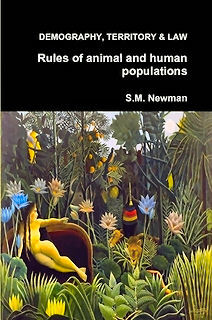 See S.M.Newman, Demography, Territory & Law: Rules of animal and human populationsChapters Two and three. Some specific criticism of predator-prey theory applied to kangaroos (endnote) and review of other population theories, pp 79-85. Back in 1992, Kangaroo meat for human consumption passed in NSW Upper House by ONE VOTE from the Rev. Fred Nile. ALP was totally opposed, especially Bob Harrison, MP for Kiama who warned of the consequences. Bob Carr promoted kangaroo meat when elected Premier and put it on the NSW Parliamentary menu. THINKK in 2011 released a new paper arguing against the kangaroo harvest on animal welfare grounds. Their key claim is that that shooters are missing the mark and joeys are being left to die. 2012, Australia's largest kangaroo meat supplier has been given permission to resume exports to Russian after a four-year ban. Macro Meats manager Ray Borda says it is a turning point for the multi-million dollar industry. Senator Carr, a late entrant into Federal Parliament last year when he became the Foreign Affairs Minister, describes with zeal his conversion to a protein-rich diet of salmon, kangaroo, organic steak and unsalted almonds. The animal rights activist group Voiceless claims Bob Carr, the new Foreign Minister and former NSW Premier, as one of its Councillors. The involvement of people like Bob Carr gives Voiceless some respectability, but it's hypocritical if he is a big meat eater and promoter of kangaroo meat! Voiceless was established in 2004, it says, to “improve the lives of animals harmed by factory farming and the kangaroo industry in Australia". Its Council is described as “an influential group of supporters representing the breadth of Australian society". This meat-laden diet, including kangaroo meat and his promotion of this product hardly makes him a candidate for Voiceless! Rather than giving Voiceless credibility, he's detrimental to their cause! I am writing to several media outlets with the same comments, and concerns. Many people have noticed that the plight of animals in floods and bushfires are often ignored by media; or simply spoken of as ‘stock’ or possessions, as in the story of the 400 dairy cattle that were washed away (I’m glad that at least made the media), but it’s usually all about the owners and their losses. The animals are spoken of as mere possessions that have been ‘lost’, like a wallet, as opposed to terrified and often abandoned animals left to slowly drown. There was plenty of warning that this rain depression was approaching. Yes people die too; and so do birds and cats, dogs, sheep, possums, kangaroos, wallabies etc. But it seems that the only time animals are mentioned in the media is when, if ‘lost’, it will be a (temporary) loss of profit to the owners; as in the story of the race horses currently stranded on a track somewhere surrounded by water. People are only worried because race horses bring dollars. They are only valuable until they lose a race. It’s all about dollars. Those in the media need to know that living animals are more important than mere objects. I see journos ask people if they were able to get all their possessions out of their houses but they never ask if they got their animals out ok. It’s very rare if they do. This should be mentioned as a normal part of the inquiry. Animals are living, feeling, sentient beings who feel fear, pain, anticipation and anxiety just as we do. And companion animals are no less than a part of our families. Many of your viewers and readers believe that it’s important that your journos consider this when they are interviewing people during times of natural disasters when everyone feels the stress, not just the humans.